Can we afford our Gadgets? The question people do not address is money. According to company responses to the Frontline story, the entry level workers at Foxconn earn about $349 a month, with those past probation earning somewhat more. They do not have sick leave, health care, or vacation benefits, so the $349 is probably pretty close to the total labor cost. One such worker carved (“deburred”) the logo in 3000 iPads a 12-hour day, about 4 a minute. Forbes points out that this worker would probably be replaced by a machine if the work did come to America. But could we design and operate a clean-and-fast machine assembly line for as little cost as these low-paid workers? Probably not – or at least one gadget or electronics manufacturer would still be operating in the US. One blog writes that “human costs are built into an iPad,” and it is doubly correct. Not only have people labored in inhumane circumstances. No, the reality is this: the only way to build all the gadgets at the price the rich world is able (willing) to pay – all the televisions, phones, iPods, iPads, laptops, remote controls etc. – is to avoid paying a decent wage. Most of the material goods we enjoy are affordable because they have been subsidized. The subsidy is the donation of labor for a wage so low it does not support a minimally adequate lifestyle. What can I do about Foxconn? Many people want to see conditions at Foxconn – and all the others like it – improve. The Fair Labor Association and public outcry may cause some local changes – but the work itself may be shifted elsewhere. Paying higher wages and improving the factor would add a few dollars to the cost of an iPad or Blackberry or 42″ television – and consumers already complain that they cost “too much.” One or two factories may improve, but the hundreds of electronic devices that surround us will continue to be made by underpaid workers. But does it help anyone if we stop using these devices? 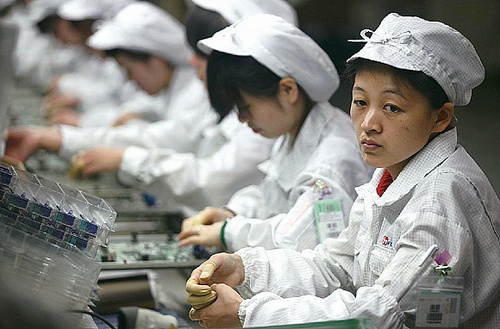 Not really – an unemployed Chinese worker has even less than today’s Foxconn employee. This brings us face-to-face with the ghost in the works of consumer capitalism: it only knows the dynamic of growth, of selling more and more stuff. People can only afford all these things if the prices are incredibly low – so we have the Foxconn’s of the world. But this rush-to-the-bottom for production costs reduces the wages of workers in the developed world, and puts many of them out of a job when a machine takes over their job. The real wages of the lower half of American workers have stagnated or declined in the last decades – but we succumb to the pressure to have big TVs, new cars, gadgets – and lots of personal debt. Strapped for cash, we demand lower prices on all we buy – pushing down the wages around the world, and – unwittingly – pricing ourselves out of a job. The labor subsidy built into each gadget is cashed out by the upper management and stockholders – the top 5% whose incomes have skyrocketed. The remaining option is to purchase goods at their real cost, unsubsidized by low-wage labor. This is perhaps possible for some items like clothing or furniture that can be purchased from local artisans. But gadgets and apps require high-tech workrooms and identical characteristics. An individual has no way of purchasing a smartphone or a laptop and making sure the funds get back to the worker. The Fair Trade movement in coffee and chocolate offers an interesting model. People choose to pay more – often significantly more – for the assurance that growers were paid something closer to a living wage. There are two coffee markets: low-cost where most of the business is done, and fair-trade, which has its own niche. Will we begin to see Fair Labor Tablets or Smartphones? This might be the spot for a company – and Apple might be it – to parlay an improvement in workers’ lives into part of its brand. On the other hand, Fair Trade coffee may cost more as a percentage but, to the individual consumer, the cost is measured in quarters or maybe a dollar. The same percentage, applied to the cost of a television or iPad, might not be so easy to swallow. People need to receive a fair wage for the work they do. There will be repercussions for that–goods that some of us can’t afford, for instance. But no one should have to contribute “free” labor just so I can have the latest toy. The other aspect of all this is that when these toys are just within financial reach, even if it’s a stretch, then more and more people get them, creating a false “need” for the rest of us who have to coexist in the work and social world. This means more to spend our money on–even though wages aren’t keeping up with all the spending we “need” to do. i agree with fare labor laws.